Germany fans watch a match between their team and Sweden during the 2006 World Cup. Flickr/Lord Khan. Some rights reserved. This past weekend, the German national football team won the European Women's Championship for the eighth time. Last week, people crowded around a television screen to watch the semi-finals at a beer garden in Berlin. There were no German flags decorating the garden, the most widely recognisable symbol of newfound German nationalism that becomes a topic of conversation whenever the men's national team plays in a World Cup or European Championship. In contrast to the fan base of the women's team, the fans of the men's national team are pointed to for their burgeoning nationalism, often seen as reason for concern in contemporary German society. Although the stereotype of German aversion to overt symbols of nationalism has become well-known in the previous decades, sensitivity to outbursts of patriotism is evident in the many fan groups and local organisations dedicated to ridding the sport of racism and discrimination. In Germany, where wariness of various strands of discrimination is widespread, racism seems to be a more openly acknowledged counterpart to nationalism. German flags at football games or viewings have become normalised over the past few years, alarming anyone who sees these displays as signs of a growing tendency towards mainstream nationalism. A number of players in Bundesliga clubs, as well as in the national team, are either themselves immigrants to Germany or are the children of immigrants. Though some fans are enthusiastic, even proud of today's multi-ethnic, multi-racial German football teams, taking pride in Germany is troubled by the historic affiliation of nationalism and racism. Andreas Hellstab is director of the German branch of Show Racism the Red Card, a Europe-wide organisation that works with teams and fans in anti-racism workshops. The German flag as an accessory for fans became markedly more present in 2006, the year Germany hosted the World Cup, says Hellstab. “It was an orchestrated party event that took place in Germany. People saw it more as a party and less as a sporting event. 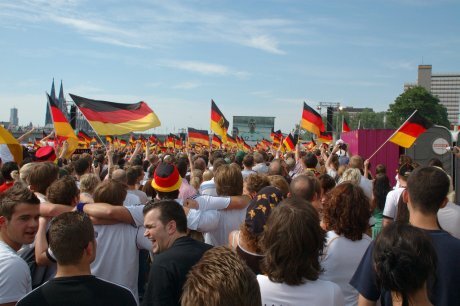 They wore jerseys and hung flags on their cars.” Although flags have noticeably remained a constant at the World Cup and European Championships since 2006, Hellstab and others see Germany's hosting debut as a watershed: before that championship fans who waved or wore flags to watch games in public were not commonplace. During the 2010 World Cup, Berlin media reported that a store owner of Lebanese descent hung a huge German flag outside his electronics store in the working class Neukölln neighbourhood - only to replace it twice after the flag was stolen. The store owner, who was verbally challenged by a number of critical passers-by, referred to the culprits as opponents of German nationalism. For some German leftist movements, epitomised by the “Anti-Germans” group, German nationalism is a central problem, and the display of the German flag can trigger angry protest. Among the flag-covered items that suddenly show up every two years on television and in public places showing games, party glasses and underwear are now classic instruments of silliness. Though many people concerned by a potential new wave of brewing nationalism take the public display of the German flag seriously, the sheer silliness of some of the flag-covered merchandise has deterred some observers from naming these a real threat. Sports historian Diethelm Blecking calls this kind of display of the German flag a "deconstruction of this symbol," adding, "I wouldn't call that nationalism. Nationalism is activated by a program, a social movement." A bigger threat to football fan culture, as well as to Germany's society of tolerance, is the infiltration of fan groups by far-right extremists in professional German clubs, said Blecking. The far-right NPD party has organised in local clubs and in ultra groups; during the 2006 World Cup, the party sponsored posters attacking non-white players in the German national team. Borussia Dortmund, which came in second place in this year's Champions League final, has recently attracted attention for a prominent group of neo-Nazis in its fan base. Although some fan groups are by now notorious for their far-right members, Blecking argues that German ultras are politically diverse. Fans from far-right groups have increasingly made themselves less conspicuous in stadium crowds. According to Patrick Gorschlüter, spokesman for the Association of Active Football Fans (BAFF), video surveillance has virtually wiped out obvious signs or flags from far-right groups at games. "Now there's video surveillance in every large football stadium. Although in the 1980s and 90s it was totally normal for a Reich War Flag to be hanging on a fence in the stadium, people would likely get caught on camera and be written up for showing banned symbols". As a result of surveillance, Gorschlüter said, hooliganism has drastically declined as well. The German Football Association (DFB), for its part, has pushed reforms that address intolerance and racism in local clubs and in the national teams. The 2006 World Cup in Germany provided stimulus for a widespread rethinking of how the organisation, the world's largest sports association, might be tainted by decades-old legacies of German nationalism. "After the Second World War, there wasn't a single DFB president who wasn't from the CDU (the moderate-right Christian Democratic Party)," said Blecking. In preparing for the 2006 World Cup, the DFB turned to its early 20th century history, establishing the Julius Hirsch Prize, named after the pre-war Jewish footballer who became a star of the German national team before falling foul of Nazi-era racial laws and being deported to Auschwitz where he later died. The prize has been awarded annually since 2005 to groups that work to combat intolerance or discrimination in German football. Among the other DFB-sponsored initiatives leading up to the World Cup was a historical monograph on football during the Third Reich and the DFB's own role in Nazi Germany. "In the last 10-12 years,” Blecking said, “a national-conservative association has transformed into an association that sees itself as a global player and that presents itself as modern." As the DFB continues to invest in anti-discrimination programs and advertising, the German national team, as well as the Bundesliga's most prominent clubs, have grown more successful, and, as a result, have become more popular among fans. The Euro crisis, which has been blamed for the emergence of a new kind of self-congratulatory German pride, hovered around media coverage of the 2012 European Championship as the German team faced rivals from southern European countries. Next year, when the German team heads to Brazil for the World Cup, interest in the effects of the championship on German fans' self-perception is likely to resurface. Whereas nationalism has for decades been a concern of some fans and other groups within Germany, international awareness of pride tied to German success is growing.